Lost-wax casting (also known as ‘Investment Casting’ or ‘Precision Casting’) is a very ancient casting process in which a duplicate metal sculpture is cast from the original sculpture. The oldest known example of the lost-wax technique were objects discovered in the ‘Cave of the Treasure’ hoard found in southern Israel, which belongs to the Chalcolithic period (4500 - 3500 BCE). These pieces are estimated to date from around 3700 BCE. Lost-wax casting was an extremely popular method of producing pieces during the Bronze Age and was used extensively in the manufacture of both household items and objects of art. The process allows for the casting of extremely intricate and detailed pieces, where the mould has to be broken to remove the casting. The process was used in Britain as early as the 1st century BCE, culminating in the design and production of pieces of exceptional beauty, such as the Gloucester Candlestick (Victoria and Albert Museum). This exquisite piece was made as a single piece wax model. A complex system of gates and vent were devised before the piece could be invested in a mould. Lost-wax casting declined in popularity during the 18th century when a piece-moulding process came to predominate. 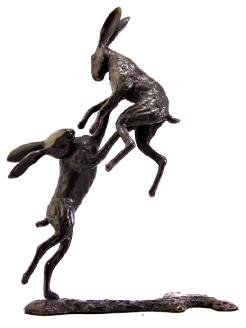 At Unique Bronze we only cast in British foundries, using the lost-wax method to preserve the incredible detail the artists put in to their sculptures. By using this method exclusively we can guarantee high quality reproductions of the artists original sculptures.